Céline Bedat decided at a young age to focus on creation. She studied in several art schools in Paris : ENSAAMA art school (Olivier de Serre class), Formamod Fashion Schhol in addition to Espace et Matière (Space and Material). At Olivier de Serres, she has been lucky to have as a teacher the famous designer Serge Mouille who marked her with his genius and kindness. In 1998 Céline Bedat exhibited her work for the first time, and has since then devoted, herself exclusively to the creation. “Everything becomes beautiful if one knows how to enhance it, when one has respect for the human being and when one believes in it.” The artist is inspired by life, the sun, people, architecture, words,… From our passage on the earth, she wants to convey messages. Her art is a testimony of love and gratitude for Life. Céline Bedat is telling us something about the world, whether figurative or abstract, with a hint of dream and feeling. She expresses herself through her paintings using the whole color palette and different materials like paper, pigments, clay, inks or gold and silver metal leafs. 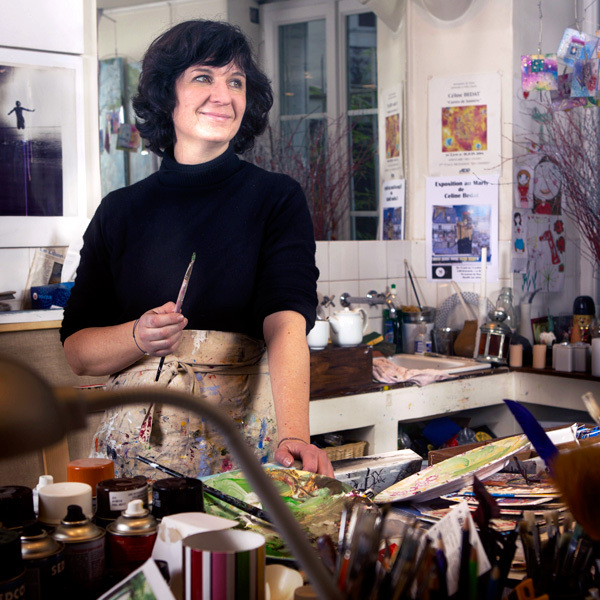 Born in 1967 near Paris, Céline Bedat has established her studio in Neuilly-sur-Seine since more than twenty years ago. She regularly exhibits in Europe and Asia.